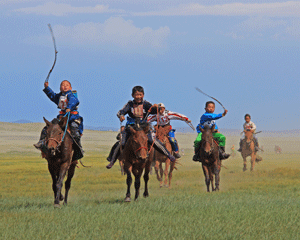 Naadam is one of the Mongolian traditional annual festivals that have been celebrated in Mongolia over millennia. The festival have become the cultural sanctity of nomads on the great steppe, keeps tradition and customs alive from ancient times. This cultural & nature sightseeing Mongolia tour with fixed date gives you opportunity to visit the famous Gobi desert, Terelj national park and to see beautiful Naadam festival in Nalaikh town. Book with us and get 10% discount for your direct booking! Mongolia is a wonderful country of cultural and natural wonders, where its’ people practice their ancient traditions and cherish the Mother Nature every day. And the Naadam Festival is the biggest celebration of the Mongols, which the nation has been celebrating since the time immemorial. It’s said that nomadic tribes gathered to tell whose men are the best wrestlers, whose archers are the finest and whose horses are the fastest; the winners were acclaimed extensively. Naadam, hence, was named as “Three Manly Games of the Mongols” nevertheless women also can participate in archery and horse racing. 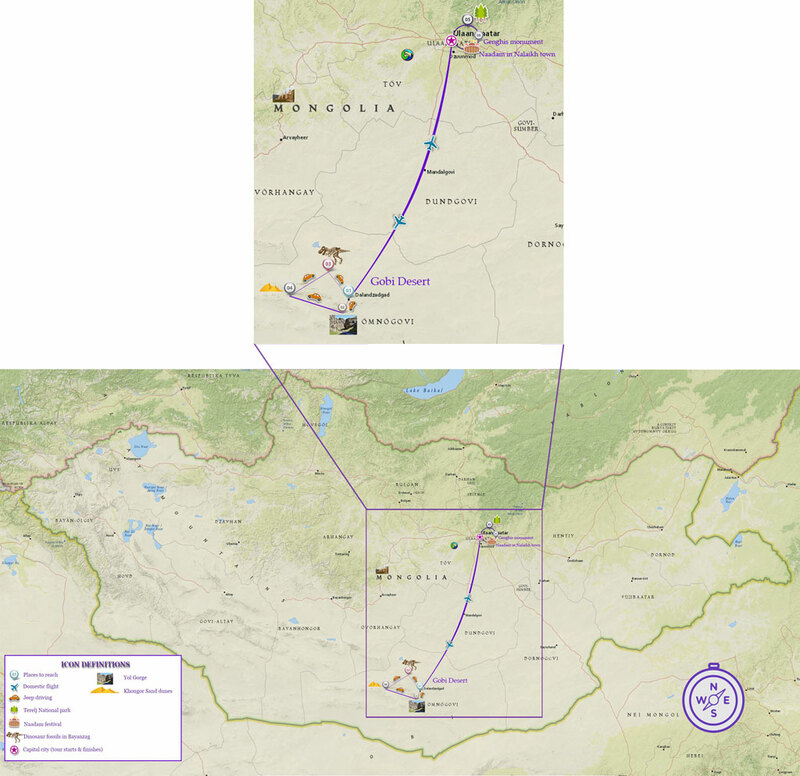 During the Great Mongol Empire time Naadam was also an important event for the Golden Horde as the Mongol princes held the Khuraldai (meeting) then. Since 1921, the Mongols started celebrating Naadam in July to commemorate the People’s Revolution of Mongolia, and the State Naadam in Ulaanbaatar is on 11-12 July fixed, and provincial and regional Naadams taking place on 8-15 July usually (depends on the summer & pasture). Naadam is celebrated nationwide in Mongolia and is a public holiday. Naadam-goers and competitiors from far and near wear their best traditional costumes and head out to Naadam – all happy. And there’s lots of music and dances to complete the jolly atmosphere. On this exciting 8-day tour you won’t only attend the Naadam Festival but also will visit the highlights of the Gobi Desert. 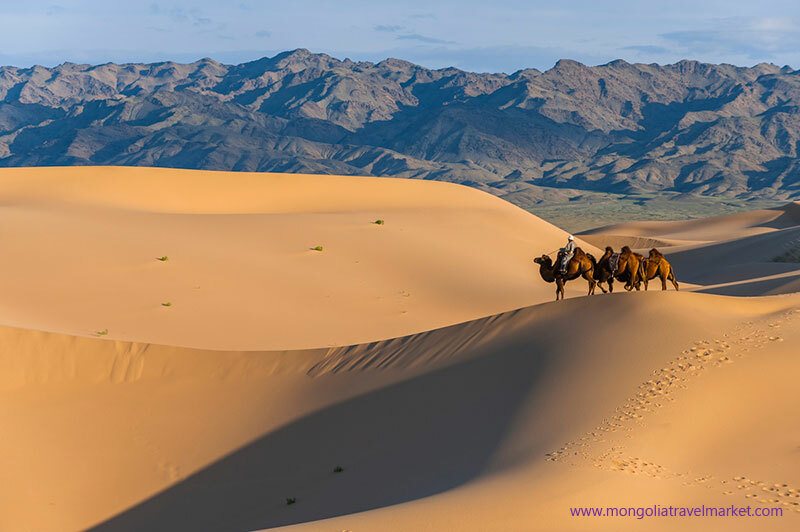 You will admire the sunrise over the Bayanzag – Flaming Cliffs, enjoy a short camel ride at the Khongor sand dunes & oasis and the walk the glacial Yoliin Am Gorge during your stay in the Gobi. Besides, Mongolia’s the home of hearty nomadic people, whose lifestyle has not been changed a lot since the days of Genghis Khan and his empire. You might have heard many stories of travellers being dazed by the sincere hospitality of the nomads. However, if you look deeper into their spirit, you will witness how strong, stern nomadic men can be moved to tears by their race horses rushing to a finish line. Their lifestyle, religion and philosophy are shaped by the Mother Nature to a great degree; and nomadic customs, music, literature and costumes have been passed through centuries. And in this hectic 21st century only Mongolian nomads welcome strangers with unlocked doors. There will be plenty of occassions you will meet real nomadic people and enjoy their heartwarming hospitality during the journey. 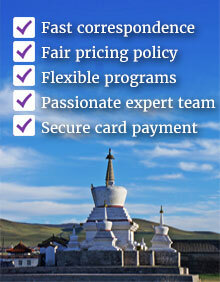 Premium Travel Mongolia tour guides are knowledgeable, experienced, and are happy to be the ambassadors of their country. Plus, travelling extensively in remote Mongolia and discovering the wonders doesn’t mean rough travel conditions. We utilize comfortable 4×4 Land Cruisers, clean and deluxe Ger camps (en-suite) to complete your wonderful Mongolia stay with us. Day 2. Jul 06. Ulaanbaatar: City sightseeing tour. 8hr excursion. Meet with your tour guide at the breakfast and meet with rest of the group and group briefing. Start the Ulaanbaatar city tour leisurely with visits to the most principal sites of Ulaanbaatar including the Gandan monastery – a home to the 26m gilded statue of Megjid Janraisag, and the National Museum of Mongolia. Have welcome lunch at a Mongolian restaurant. Free time at your leisure before we head for the traditional folk concert at 17.00hrs and an evening stroll at the Main Square viewing Giant Genghis monument and parliament building on the way to your hotel. 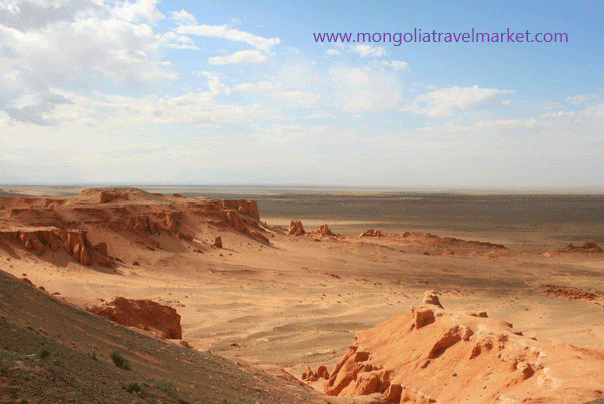 Morning pick up at 5.00am and transfer to the airport for a flight to the Gobi Desert (scheduled at 07.00-08.20hrs). Upon arrival have breakfast at a local hotel and start your day trip visiting the glacial Yoliin Am Gorge in the beautiful Gobi Gurvan Saikhan Mountains. Eagles overhead scour the desert for prey, while below families of nomads gather for felt-making, or stand in groups beside their livestock at the scattered wells. Enjoy walking in the glacial Yolyn Am Gorge with sights of wildlife. Drive for 1hr to a deluxe Ger camp, where you will stay for the next 2 nights, and have lunch and rest. In the early evening, we visit the Red Cliffs at Bayanzag, enjoy the wilderness and viewing unique nature formations of the Flaming Cliffs. Explore around for dinosaur remains and walking in the rich saxaul forest. You can even find real dinosaur bones and eggs yourself! Return to the deluxe Ger camp, dinner and rest. Day 4. Jul 08. A day excursion to the Khongor Sand Dunes. 3hr drive oneway. Breakfast, then drive to the small Gobi Desert airport and take the flight to Ulaanbaatar (08.50-10.20hrs). Upon arrival transfer directly to the Terelj national park with a stop at the Giant Genghis monument – an impressive 46m statue of Genghis Khan on horseback, indeed the largest equestrian statue on earth. Afterwards, transfer to a deluxe Ger camp in Terelj National Park and have lunch. Visit the Turtle Rock and the Temple of Meditation. Return to the Ger camp in the evening, dinner and rest. 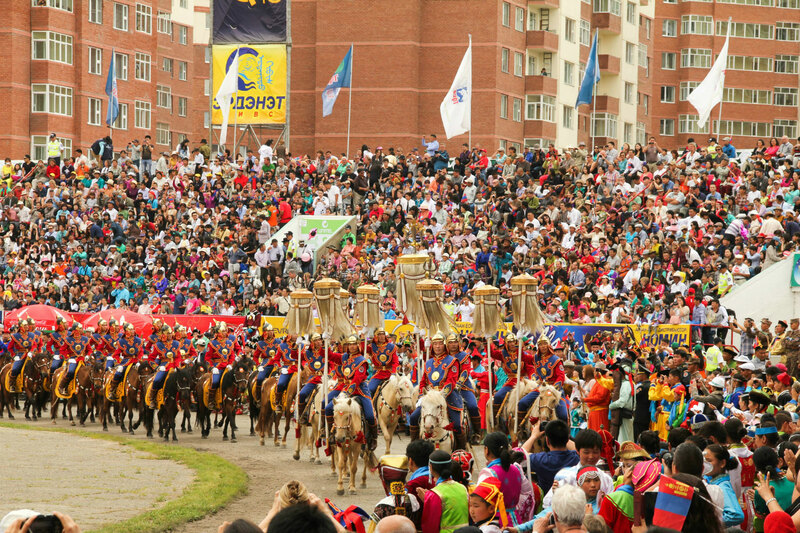 This morning, we’ll drive to the Khuin Doloon Hudag, where the Nadaam festival horse racing takes place via Ulaanbaatar. Watch 3-year old horse races and visit a horse trainer’s tent for some Airag (mare’s fermented milk) and some good chats about Mongolian horse culture and nomadic lifestyle. Transfer to Ulaanbaatar in the late afternoon, check in at the hotel. Free time for leisure, and prepare for the Naadam festivals next day. After breakfast transfer to the Central Stadium to take part in the Great Naadam Festival opening ceremonies, followed by wrestling, archery and ankle bone shooting competitions. 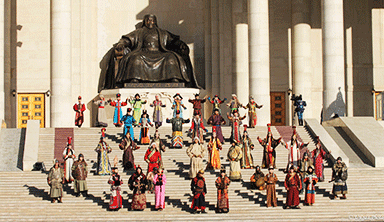 Naadam is celebrated nationwide in Mongolia and is a public holiday. There will be plenty of activities around the stadium like ankle bone shooting, photographing beautifully dressed locals etc. Naadam-goers and competitors from far and near wear their best traditional costumes and head out to Naadam – all happy. Day 8. Jul 12. Departure/extension. 50min drive. Twin/double share: excellent 4* hotel in Ulaanbaatar for 4 nights, and deluxe Ger camps for 3 nights.